Throughout his career, Alexander Payne has been repeatedly criticised for belittling Midwestern Americans with reductive bumbling idiot stereotypes. Of course, it’s clear to see that’s untrue; a film like 2013’s Nebraska – the finest film in his career – works due to the sheer empathy afforded to characters on a complete pipe dream of a road trip. When he’s inviting the audience to laugh at, and not with, the characters, it’s always done with a purpose – the characters in Sideways and Election (to name two examples) behave appallingly, and our laughter at their circumstances prove to be one of the few comeuppances afforded to them. 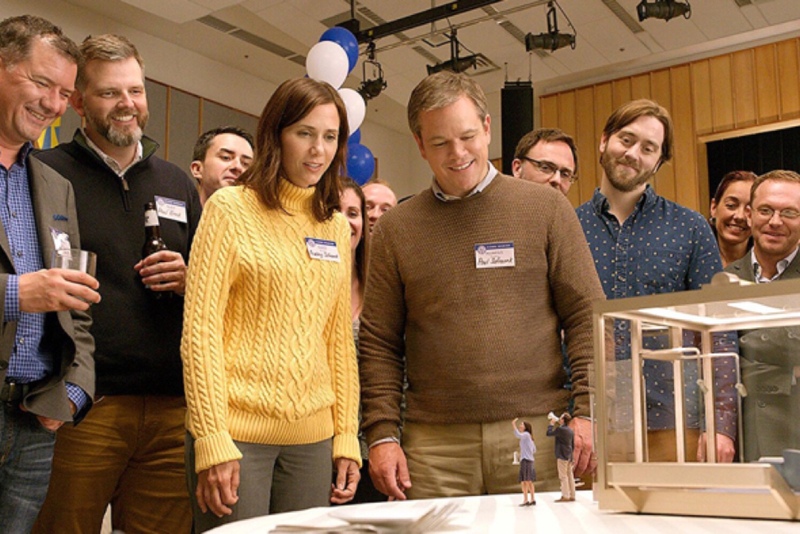 Downsizing, his big budget latest feature, is the first time when the oft-repeated criticism of the director’s characterisations rang true for me. This is an oddly cruel film, with a wide visual imagination frequently undercut by the narrow minded characterisations and a highly unfocused narrative that can’t work out whether it’s acting as political commentary, or a half baked adventure movie. By the film’s halfway point, the only Downsizing I was looking forward to was the inevitable low budget project Payne will make next, after this inevitably flops and he’s forced back to the drawing board. In the not too distant future, Norwegian scientists have uncovered a way to save the planet- shrink the population, and save on carbon emissions by living life in miniature. As the years go by, more and more people opt to live this lifestyle, and eventually, Paul Safranek (Matt Damon) begins to see the positives. He’s lived in the same house all his life, and is struggling to find a nice place to move to with his wife (Kristen Wiig); upon hearing about the benefits of downsizing, where $150,000 in savings instantly becomes $12 million, the pair jump at the chance. That is, until he is left stranded in “Leisureland”, as his wife gets last minute jitters, and he can’t reverse the procedure. After befriending a strange, party loving, Eastern European neighbour (Christoph Waltz), he soon begins to see the benefits of living life in miniature. This has been a long gestating passion project for Payne, as he has been waiting for the right moment to get his ideas represented onscreen accurately. From the contrast between small and normal sized people, finding ways they can communicate while acknowledging their vast differences, as well as the intricate designs of the specially created cities, not a single shot of Downsizing is wasted. The first 40 minutes of the film, where he explores the infinite possibilities of the concept prior to the lead character taking the procedure, are when the film is at its best. As soon as we shrink, no amount of sheer visual inventiveness can detract from increasingly misjudged narrative strands that aim for contemporary social commentary, but wind up feeling outdated in execution. This is because, inexplicably, Payne and co-writer Jim Taylor suddenly decide to make the film in to a parable about the effects of immigration- a theme they haven’t given the considerable thought clearly afforded to the eye popping visual design. The sudden introduction of a Vietnamese immigrant (Hong Chau) leads to a half-hearted examination about the American Dream, and the lack of opportunities for those heading to the country after escaping hell at home. Chau’s performance has so far been the only element of the film given awards recognition, picking up numerous supporting actress nominations, including a Golden Globes nomination. This is highly baffling, as her performance is without a doubt the most misjudged part of the film: an outdated racial stereotype with the same amount of subtlety as the prostitutes in Full Metal Jacket. In one later scene, where the character gives a monologue distinguishing between a “love f**k” and a “hate f**k”, you can clearly feel Payne and Taylor suppressing the urge to include “me so horny, me love you long time” in the dialogue exchange. None of this is Chau’s fault; there are shamefully few roles offered to actors of Asian decent in Hollywood, and the chance to work with Alexander Payne is an opportunity few would turn down. But turning a character who has escaped from nightmarish scenarios in to a mere comic stereotype, whose every scene of emotional growth is undercut by dialogue written specifically to gain maximum laughs from pronunciations in a thick Vietnamese accent, is not a fault of Chau’s- it’s a fault of Payne and Taylor, who wrote the character this way. I was reminded of the Master of None episode “Indians on TV”, where actors of Asian decent all confess they can only get roles if they lean in to exaggerated stereotypes; I thought this practice had died out, but unfortunately, it’s still here and as shameful as ever. The treatment of this character was the moment I finally understood why so many people have characterised Payne as a cruel filmmaker over the years. In summary, Downsizing is a visually adventurous film, ill served by an unfocused storyline and a reliance on misjudged characterisations of foreign characters in order to generate laughs. Nebraska was Payne’s best film to date because it dug beneath pre-existing stereotypes in order to find humanity- and this is his worst because it focuses on getting cheap laughs from stereotypes instead of digging deeper to find anything remotely human.